At least 200 people were killed and more than 1500 injured in riots Sunday in China's far western province of Xinjiang, China's state media reported Monday. It's the worst ethnic violence in China in years, if those numbers are correct, and a sign of how sharp ethnic tensions have become in the remote, desert region. Xinjiang's native ethnic Uighur population has long complained of discrimination by Han Chinese settlers who have flooded into the province and are now the majority. Thousands of Uighurs poured into the streets of Urumqi, the capital of Xinjiang, on Sunday, according to eyewitness accounts. The New York Times reports that rioting raged for several hours on Sunday, before Chinese government troops locked down the main Uighur part of the city. The violence began after police challenged protesters who were demanding a probe into the killing of two Uighur workers in a June 26 brawl at a toy factory in southern Guangdong Province. China's state-controlled media is portraying the violence in Xinjiang as an orchestrated attempt by ethnic Uighurs to terrorise Han Chinese in the region. The scenes of violence on television show the crowds attempting to overturn a police car and throwing stones at the security forces. Vehicles are on fire. Two women, both Han Chinese, are shown looking on in shock. Both have blood on their hands. One wipes the other's face as she tries to comfort her. A man who looks like he has been beaten is shown sitting on the side of the road. The scenes are being repeated hourly on news bulletins on state television stations. The reports were the second and third item on the national news broadcast at 1800, including a report from a hospital treating some of the injured. It is clear, though, that the authorities are doing their best to restrict the amount of coverage available from independent sources on the internet, on sites like YouTube and Twitter. Access to Twitter in China appears to have been blocked following the protests. Users outside the country report that some images of what appears to be a peaceful protest, initially at least, have been uploaded onto YouTube. It is difficult to see that footage in China at the moment though, and so impossible to verify where and when it was shot. YouTube has been difficult to access here for some weeks. The Chinese version of Twitter, Fanfou.com, has not been blocked but efforts to search using keywords like "Xinjiang", "Urumqi" or "riots" return no results. On other Chinese news sites such as sina.com, sohu.com or 163.com, the official version of the incident in Xinjiang has been posted but internet users are prevented from leaving comments underneath. China's response to Sunday's violence has been to accuse foreign forces of fomenting the unrest. The country's official news agency, Xinhua, quoted an unnamed Chinese official who claimed the riot had been "masterminded by the World Uighur Congress". The violence was "pre-meditated and organised," he is reported to have said. 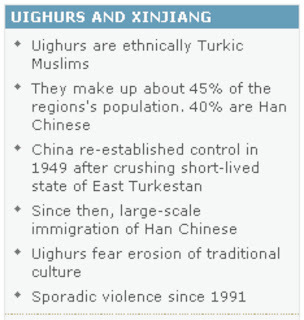 Uighur groups in the US deny this. They say they are being blamed as a way of distracting attention from the real cause of the Uighurs' discontent, the discrimination they face and the oppression they are subjected to by the Chinese authorities. It is not the first time the Chinese have suggested this kind of violence is the work of "separatists". They made similar claims after riots in the Tibetan capital Lhasa last year. The streets of Urumqi, the capital of Xinjiang, are reported to be quiet although eyewitnesses say there is a heavy security presence. It is also reported to be impossible to access the internet in that part of China at the moment. Throughout the morning in China, the official news agency Xinhua offered several updates, revising upwards the estimate of the number killed and injured. Much of the information came from a news conference in the regional capital given by local officials. A serious outbreak of ethnic violence like this is, of course, a concern for the authorities. One of the sparks was said to have been an incident last month in southern China in which two Uighurs were killed during a clash between workers from the Uighur and Han communities. 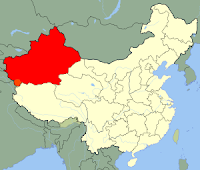 Xinjiang is, however, a remote part of the country, some 3,000 km ( 1875 miles) from Beijing, so the violence there is unlikely to have much of an impact elsewhere in the country unless there is a sense that in Urumqi the authorities are losing control.